The giant panda weighs 70 - 125 kg (154 - 275 lb). It occupies montane forests with dense stands of bamboo at altitudes of 2700 - 3900 m (8850 - 12,800'). The panda does not hibernate but descends to lower elevations in the winter (usually not lower than 800 m (2600')) to reach warmer temperatures. It does not make a permanent den but takes shelter in hollow trees, rock crevices and caves. Although it is predominantly terrestrial. the giant panda can climb trees well. Activity patterns are largely crepuscular and nocturnal. Ten to twelve hours a day are spent feeding, mainly on bamboo (which comprises 99 % of its diet). Giant pandas are usually solitary, except during the mating season. The giant panda has been declining for thousands of years due to hunting by humans and climatic changes. Its populations originally extended throughout most of southern and eastern China, northern Myanmar, and northern Vietnam. By 1900, it occurred only in the Qinling Mountains and along the edge of the Tibetan plateau. Soon after 1900, the expansion of agriculture upstream along principal river valleys separated this distribution into separate regions in six mountain ranges. Currently, the giant panda occurs in portions of these six mountain ranges in China's Gansu, Shaanxi and Sichuan Provinces. The greatest threat to panda survival is the loss and degradation of its habitat. The giant panda's range is steadily shrinking as logging operations - many of them illegal - fell trees, and peasants clear land for farming or harvest vegetation for fuel. Already panda populations are small and isolated, confined to high ridges and hemmed in by cultivation. Poaching was a serious problem in the past, but it has dropped off, and it is no longer considered a major problem in substantial portions of the range. Furthermore, pandas' body parts have not been sought for use in traditional Chinese medicine. Giant pandas are killed, however, as victims of poachers' snares set for musk deer. 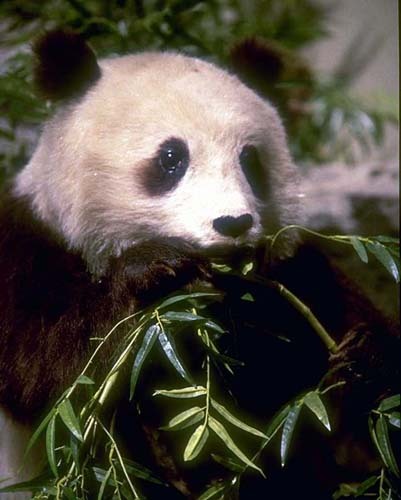 An indirect threat from habitat fragmentation relates to the panda's reliance on bamboo for food. This threat arises because bamboo stands are subject to periodic large-scale die-offs. In the past, when bamboo died off, pandas could migrate to areas with healthy bamboo. But with fragmented habitat, this may not be possible. *** In 1995, a Chinese farmer who shot and killed a giant panda and tried to sell its skin was sentenced to life imprisonment (Oryx 1995q) . 2004: Occurs in China (Gansu, Shaanxi, and Sichuan Provinces) (IUCN 2004). The greatest threat to panda survival is the loss and degradation of its habitat. The giant panda's range is steadily shrinking as logging operations - many of them illegal - fell trees, and peasants clear land for farming or cut down vegetation for fuel (Litchfield 1992) . Already panda populations are small and isolated, confined to high ridges and hemmed in by cultivation. Panda pelts can bring two to three times the average annual income of a rural Chinese peasant in some Asian markets, and poaching was a serious problem in the past. However, as a result of enforcement and education, poaching intensity has dropped off, and it is no longer considered a major problem in substantial portions of the range. Giant pandas are still killed as victims of poachers' snares set for musk deer. (Reid & Gong 1999) Pandas' body parts have not been sought for use in traditional Chinese medicine (Schaller et al. 1985) . An indirect threat from habitat fragmentation relates to the panda's reliance on bamboo for food. Bamboo stands are subject to periodic large-scale die-offs, but in the past, when bamboo died off, pandas could migrate to areas with healthy bamboo. With fragmented habitat, this may not be possible. Since pandas are solitary and shy, they generally will not go into human-populated areas. Cut off from these areas, the pandas have no recourse to alternative food supplies when die-offs occur. Length: 160 - 190 cm (63 - 75"); Weight - Females: 70 - 100 kg (154 - 220 lb), Males: 85 - 125 kg (187 - 275 lb) (Reid & Gong 1999) . The giant panda occurs in montane forests with dense stands of bamboo at altitudes of 2700 - 3900 m (8850 - 12,800'). It may descend to as low as 800 m (2600') during winter (usually not below 1200 - 1300 m (3900 - 4300') because of man's impact on its habitat) to reach warmer temperatures. In the wild, pandas do not reach sexual maturity until they are at least 4.5 years old, and perhaps not until they are 7.5 years old (Reid & Gong 1999) . In captivity, both sexes usually reach maturity at the age of 5.5 or 6.5 years (Schaller et al. 1985) . The mating season is mainly from mid-March to mid-May. During this period, females are only fertile for 2 - 7 days. Females without young may also come into heat in September-October and very rarely in January-February. (Reid & Gong 1999) Births usually occur during July-September (from the Spring matings). A young giant panda becomes independent of its mother at 12 - 22 months after birth, usually about 18 months. One animal lived to an age of about 34 years in captivity. The lifespan in the wild is unknown. The giant panda's diet consists mainly (over 99% (Schaller et al. 1985) ) of bamboo shoots, up to 13 mm (1/2") in diameter, and bamboo roots. It also eats bulbs of plants such as iris and crocus, grasses and occasionally fish, insects, carrion, eggs and small rodents. With a digestive system characteristic of a carnivore, the giant panda is very inefficient in digesting bamboo, utilizing an average of only 17 % of the dry matter. Therefore, adult pandas must eat 10 - 18 kg (22 - 40 lb) of bamboo per day to get enough nourishment. The giant panda does not make a permanent den but takes shelter in hollow trees, rock crevices and caves. It spends 10 - 12 hours a day feeding. It is mainly terrestrial but can climb trees well. Activity is largely crepuscular and nocturnal. It does not hibernate but descends to lower elevations in the winter to reach warmer temperatures. The giant panda has an enlarged, movable wrist bone that serves as an opposable "false thumb" to the normal five toes on its front paws. This bone is used to grasp bamboo stems while eating. Giant pandas are usually solitary, except during the mating season. Home ranges overlap extensively, with several pandas utilizing the same area. However each female has a core area within her range that only she uses, and this tends to reduce direct contact by spacing individuals. Giant pandas have a polygynous or promiscuous mating system; males compete for access to more than one adult female (Reid & Gong 1999) .